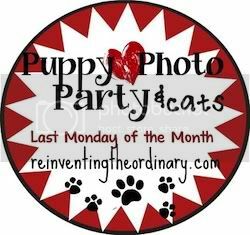 I am linking up today with Reinventing the Ordinary's Puppy Photo Pary & Cats. If you have a furbaby, make sure you link up to enter a chance to win a cool canvas print of your furbaby's mug shot!!! I couldn't find Sadie, so when I went to check the bedroom, I thought she would have been under the bed relaxing... but no... this is how I found her. All on her own she got on the bed, snuggled under the covers, and was asleep, until of course I interupted her. My bad. Sadie ... you are sneaky. Way to lure her away from the bed ...then double back. You're a hoot. Thanks for partying with us. Love ya! I saw you on the link up and wanted to come say hello!!! I entered my cat but enjoy seeing peoples different dogs since I'm looking to get one in the next year.